Biphenyl Azepanyl Methanone. 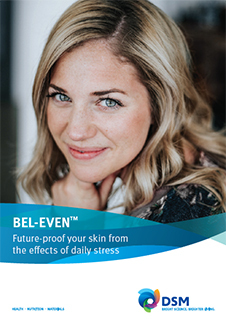 BEL-EVEN™ by DSM is an anti-stress, anti-pollution, anti-aging, anti-wrinkle agent. It rebalances cortisol level in skin by inhibiting the enzyme 11β-HSD1. It leads to more supple-looking skin with improved skin elasticity and significantly improves skin density and greater barrier integrity. It fights against stress-induced collagen loss and skin thinning. It is used in spa. It has a shelf life of 24 months.